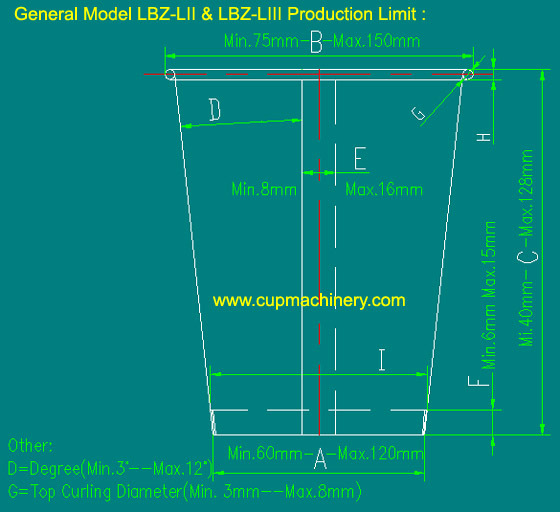 Please note: the range given is just for our general type paper bowl machines( for LBZ-LIII and LBZ-LIII paper bowl machines), if you want is a special one, don't hesitate to let us know, for we can do it according to your requirement. The above three sizes are demanded . The other sizes, E=side sealing width, F=bottom knurling height, G=top curling diameter, The more details providing is appreciated. If you don't offer the sizes E,F,G . We will choose the General Size for you.